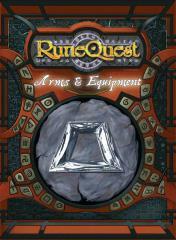 RuneQuest Arms & Equipment is a collection of new and interesting gear for Games Masters to include in their games. This equipment is designed to be used in any RuneQuest setting. There is a wide variety of new weapons including the vicious stavesword and the deadly garrote, and new types of armor such as dwarven cinder and serpentmail, giving Players a multitude of options when kitting out their character. In addition there is a host of new general items, land-based vehicles with an extended system for their use in combat and even a collection of mounts and steeds. Questing Gear & Basics – Assorted gear that any RuneQuest character might find useful. Weaponry & Armor – Items for inflicting and protecting against damage from all over creation. Transports & Buildings – Vehicles and the rules to use them in RuneQuest combat, along with details on buildings of all kinds. Beasts & Cohorts – The cost and rules to buy and train living assets, from attack dogs to weaponsmiths. The Rare & Wondrous – Items that use magic or technology, including full details on an array of black powder weapons.